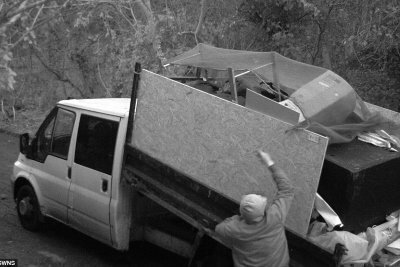 Mum prosecuted after man and van fly tips her rubbish. You might think that if you paid a man with a van to take away your rubbish and they then fly-tip it, it would be the van man who took the rap. But mother of five Kelly Holland, 38, of Allerton, Derby found out the hard way that such is not the case. Holland paid a man that she’d come across of Facebook £40 to dispose of some old furniture. But her discarded household goods tuned up at a roadside in the village of Strelley in Nottinghamshire. Officers from Broxtowe Borough Council found the rubbish. And unluckily for Holland they found a wage slip with her details on it among the debris. Holland pleaded guilty to an offence of fly-tipping contrary to the Environmental Protection Act at Nottingham Magistrates’ Court. She was fined £80 with a government surcharge of £20 and ordered to stump up £427 as a contribution towards the council’s clean-up bill. The law is quite clear that if you hire someone to dispose of your rubbish you have a legal responsibility to ensure that they have a waste disposal licence. For an offence tried in the Magistrates’ Court, an offender can be fined up to £50,000 and jailed for up to 12 months. In a case that proceeds to the Crown Court, wrong doers can be subject to an unlimited fine and a prison sentence of up to five years.